Shoes are the most important item to pack for a trip through southern Europe! Forget heels. No heels! Sturdy walking shoes are the only reasonable shoe to take and nice flats for the evenings. Believe me when I tell you that walking on stone streets and paths is not for the timid or the unbalanced. I have learned to hate St. Peter’s Stones. 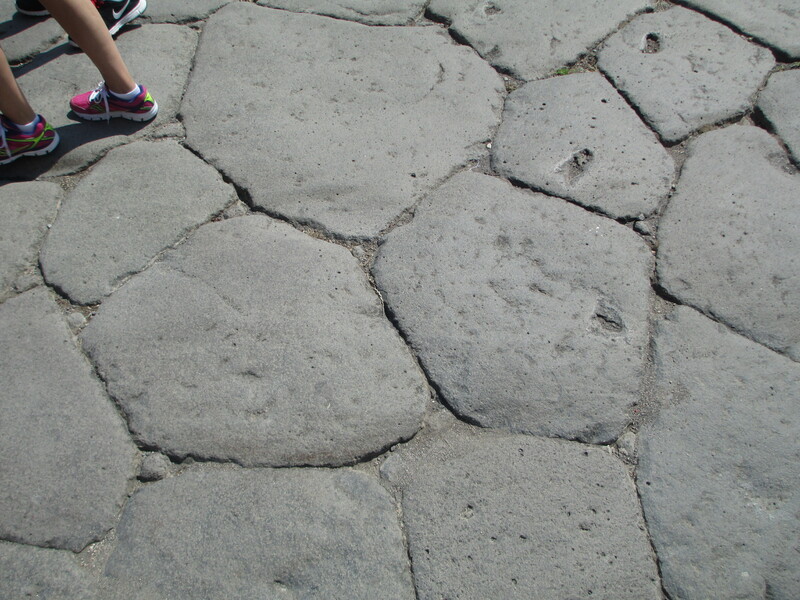 These unusual shape stones make up many of the pathways in Rome. Each stone is about 4 inches wide at one end and tapers to about 2 ½ inches at the other end. Between each stone is about a half inch of grout…if you are lucky. Most of the time the grout is missing. A great place to get a heel caught and trip. I asked some female Rome citizens how they walked in heels. Their answer, they don’t. I know why. Stone walkways in the Jewish Quarter of Rome. But it isn’t just the St. Peter’s Stones that can wear on the legs. Almost everywhere the sidewalks and streets are made of stone. And it makes sense. These are old cities. 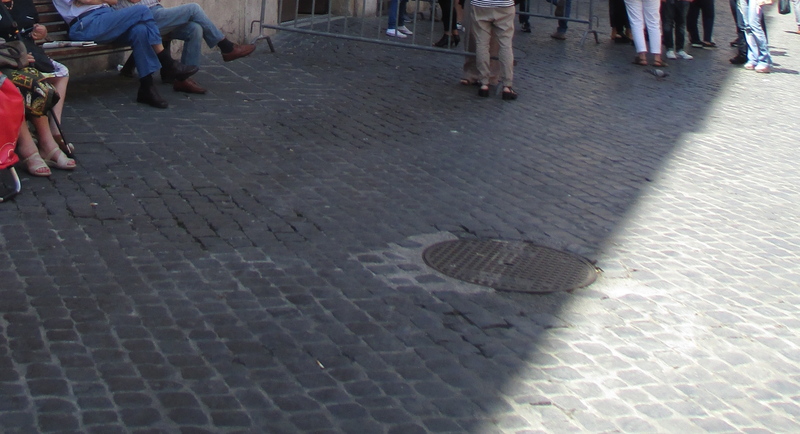 In the Jewish Quarter of Rome there were square stones that paved the walkways and streets. I say this together because in the tight areas of the old city people and cars share the streets and walkways. I cannot imagine what they are like when they are wet. We were fortunate and never encountered rain on our trip, but I can imagine that these stones cause much misery when they are damp or wet. The only place I can compare it to is Jerusalem. Also a city paved with stone, Jerusalem is a place where I have experienced rain and snow and it was not pretty! After two days of walking in Rome, even with sneakers and flats, my legs were aching. In our not quite two days in Rome, we walked 11.8 miles! And over our two-week trip to Europe I walked 62 miles, averaging 4.4 miles a day, including the two at sea days. I know for a fact as I wore my Jawbone Up the entire time! 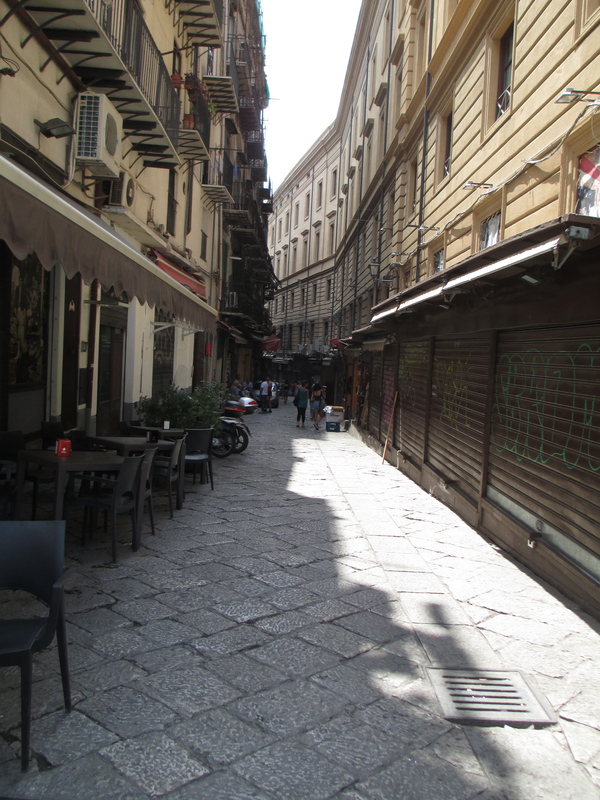 So believe me when I say I became intimate with the stone walkways of some of the cities along the Mediterranean. And I feel fortunate that we all survived intact! To be honest, the stone walkways were so beautiful, I started taking photos of them. Lovely to look at in every city and island we visited… but terrible for the legs and feet. Pompeii stone streets… Pretty good actually. I loved the incredible stone streets of Pompeii. That they lasted this long through fire and ash and 2000 years shows their durability. 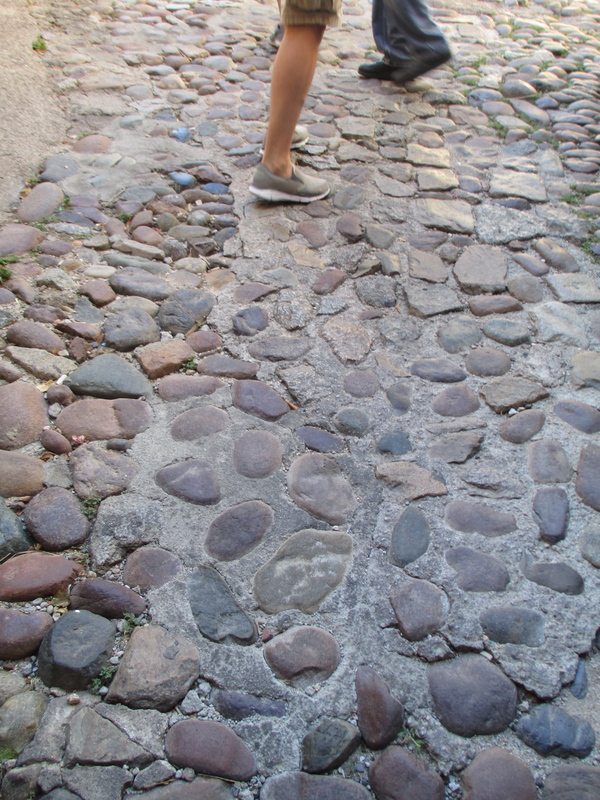 And actually the stone walkways in Pompeii were easy to walk on. I was amazed at how the craftsmen took irregular shaped stones and fit them so precisely together. They were just stunning. On the islands of Sicily and Sardinia we encountered larger, more even stones. Rectangle and squares probably made it for easier for masons to install the stonework. They were also a bit easier to walk on in the more modern parts of town. But still gave no relief to tired calf muscles! Corsica at the citadel. These stones were impossible! And yes, it was the only place to walk. After Corsica, I knew the stones were starting to take their toll on people. In Calvi, Corsica, the citadel is located high above the city. You have to walk up a multitude of stone staircases before reaching the path that takes you into the citadel. Should I call it a path, or the stone walkway from Hell? These uneven and rounded stones pushed into the ground must be carefully and diligently watched as you walk. They look like giant river pebbles. When you walk on them there can be no looking up until you take a break. Just watch your feet. I thought going uphill was bad. But going downhill was much worse. The day after the trip to Calvi, I noticed several people on our cruise ship now in wheelchairs with their ankles wrapped. An older woman, who had been on our flight to Europe, and was on our cruise, fell and was sporting a black eye. She spent two days recouping from that incident. Calvi’s citadel is not for the weak-kneed or anyone who needs help walking! 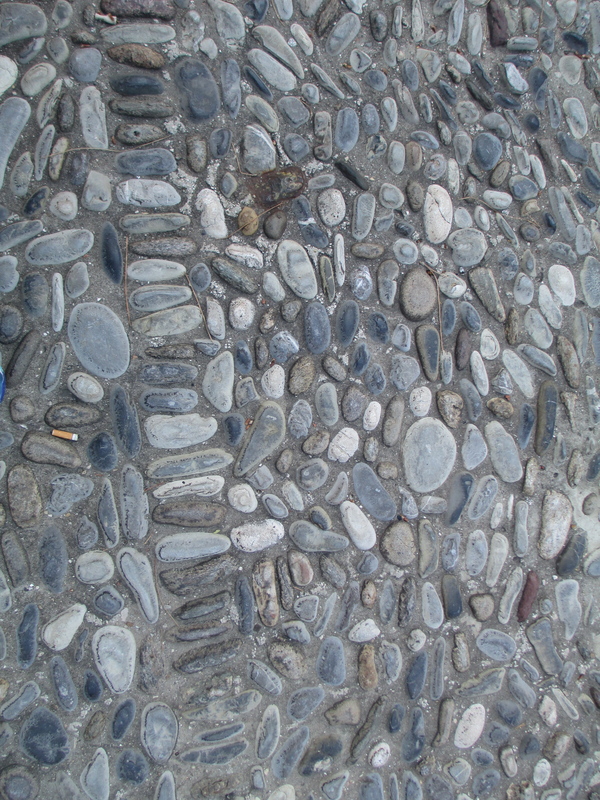 Monaco, beautiful patterned pebbles to walk on. Monaco had lovely walkways, easy to meander through. But near the prince’s palace, where we watched the changing of the guard, there was a beautiful inlayed pebbled area, so beautiful to see, but perhaps difficult for the pedestrians in heels. I just took pictures, and tried to stay off of it. Okay, honestly, I had to walk on it at least once to test it out. It was okay, just a little rough on the soles of my feet. St. Tropez, more stone for people and cars. 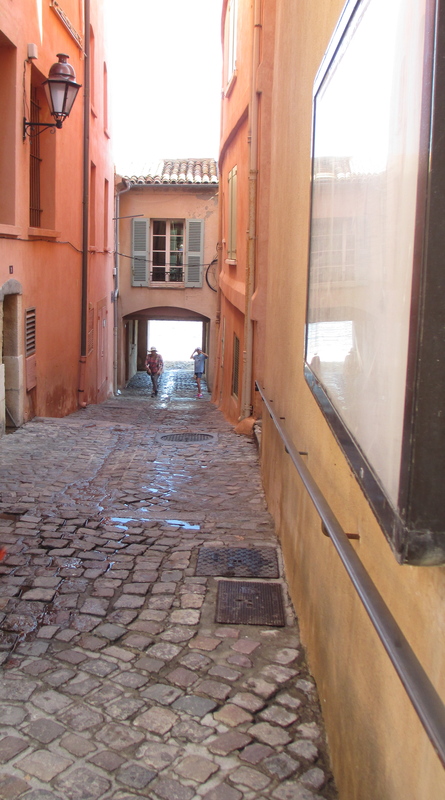 St. Tropez’ older areas had more St. Peter’s Stone’s as well as larger rectangular steps. And I do not like St. Peter’s Stone! To be honest this was my least favorite stop on our journey. However it had the best story about the paved roads. The walkways in the ancient area are all made of stone, slippery when wet. Our guide told us that when people tried to invade the city, the citizens would pour olive oil into the street, which made the hilly stone paths impossible to navigate. I wish I could have seen the invaders’ faces as the olive oil came oozing down the roads. The slipping and sliding was not funny to them, I am sure. What an ingenious idea! 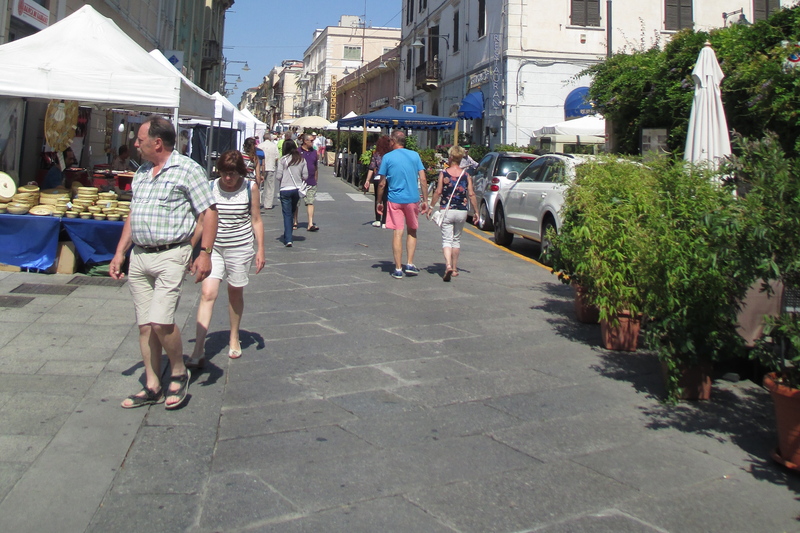 The beautifully stone paved Rambla. Easy to walk on. We ended our trip in Barcelona. The new parts of town have easy to walk on streets. 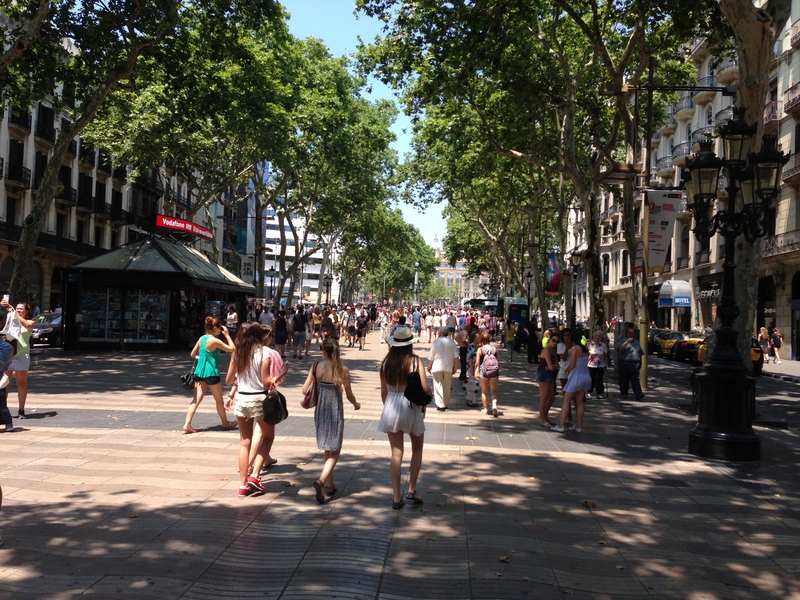 And we loved walking on the Rambla! The stonework was so pretty with waves of color. And the stones were even and comfortable for walking. But the old, gothic city also had its stone and uneven pathways. However, I understand that these streets and paths are over 1,000 years old. So I am not complaining, I am just saying BE Careful. Notice the difficult walking through the trails at Montserrat. 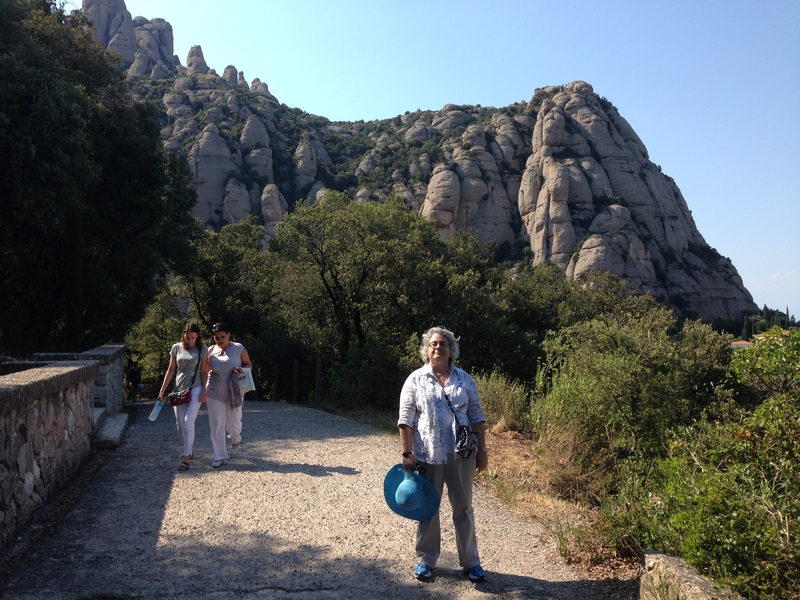 Our final stop was Montserrat, a beautiful mountain and Monastery about an hour from Barcelona. This area is so breathtaking with its views and buildings. It has three main walking paths. We took one. You can see that they are trying to repair the paths in some areas, in others it was quite the challenge. But so worth the effort! My legs are still recovering from the hard walking. To be honest, I went for a leg reflexology on the cruise ship. It was wonderful after all those stone steps. I gifted myself an extra long 75-minute leg and foot massage. I figured that my legs had done me well, and they deserved pampering. When I got home, I went for a pedicure with massage at Old Town. It helped as well. Sixty-two miles of walking on stone paths was perilous, but worth every step! I honestly do not know how you could walk in heels there !